There are many spices that can be added to your diet that can help with weight loss. More and more researches are proving cumin seed benefits that can help to jumpstart weight loss, melt away body fat, and naturally improve your cholesterol levels. What Are Cumin Seed Benefits? Cumin (a.k.a. jeera) originally grows in Egypt, but it’s been used for cooking and healing in India and the Middle East for generations. The seeds are long and brown, and have a wonderful flavour! You can buy ground cumin or cumin seeds from most major grocery stores. Cumin is sometimes confused with caraway (carum carvi) seeds and they are different. Sometimes, jeera may be translated wrongly as caraway. 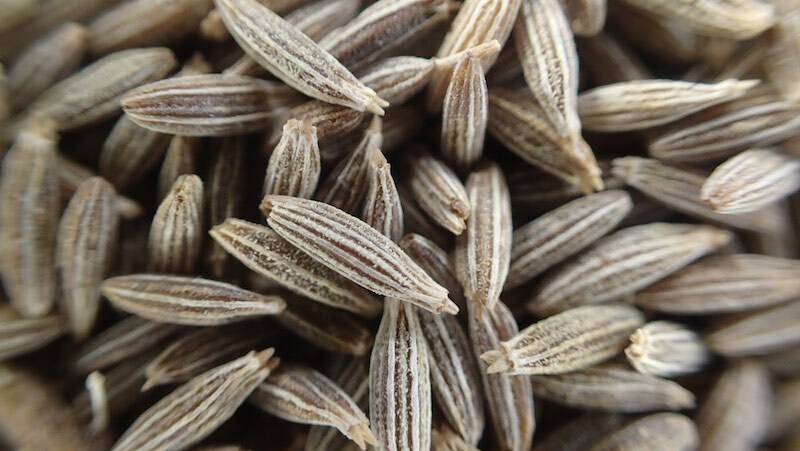 Caraway is a very European spice, whereas cumin is largely used in Indian cuisines. Cumin has high antioxidants (antiaging), anticarcinogenic, and chemoprotective properties to prevent and fight cancer, especially in cancers of the colon and breast. A compound present in cumin seeds called thymoquinone, exhibits anticancer, antioxidant, antitumor and anti-inflammatory effects. The anticarcinogenic activities in cumin are attributed to the potential antioxidative action in the tissues. Not only does cumin neutralize cancer-causing agents in the body, it also prevents cancer cells from multiplying. Cumin has antidiabetic effects when tested on lab animals. Other benefits that were observed included decreased creatinine, urea nitrogen, improved insulin and glycogen in tissue and skeletal muscles. Excess blood sugar from diabetes can cause cataracts, and cumin was shown to delay the progression and maturation of cataracts. Another complication of diabetes mellitus is hyperlipidemia (excess lipids or fats in the blood, such as cholesterol or triglycerides). Consumption of cumin seeds help to reduce body weight, plasma and tissue cholesterol, phospholipids, free fatty acids and triglycerides. Cumin seeds are great for lowering “bad cholesterols” and increasing good cholesterol levels. And what’s more important, they help reduce oxidation of cholesterol to prevent hardening of the arteries. Research shows that cumin may boost the immune system by significantly increasing T-lymphocytes (a subtype of white blood cells also known as T cells) count. Cumin contains antiseptic properties that help fight harmful bacterial and fungal infections for a healthy immune system. Cumin was also found to decrease elevated corticosterone levels and the size of adrenal glands for a stronger immune system. Cumin seeds are a rich source of iron, making it a good diet addition for individuals with anemia. Just 1 teaspoon of cumin adds 4 mgs of iron to your diet, that is nearly 22% of the daily value suggested for an adult. Besides iron, cumin also has other cofactor nutrients such as copper and folate for efficient production of heme, a component of hemoglobin that helps to carry oxygen. Ground cumin powder can be added in cooking to help synthesis of hemoglobin and blood-building. Drinking cumin seed water is another good way to supply iron to the body. In the Indian culture, ground cumin powder is added in most cooking as a digestive aid. Studies have shown that cumin has the ability to kill the H.pylori bacteria. Effectively, cumin seeds protect the stomach lining from peptic ulcers and other digestive issues caused by the bacteria, such as gas, bloating and acid reflux. When consumed, an organic compound in cumin called cuminaldehyde, activates the salivary glands in the mouth to facilitate the primary digestion of food. Then another compound, thymol, stimulates secretion of stomach acids, bile and enzymes for complete digestion of the food in the digestive system. Cumin has the right ratio of sodium and potassium to help regulate blood pressure, by balancing out the negative effects of sodium. The higher amount of potassium regulates and maintains electrochemical balance, improves blood circulation and relaxes blood vessels for normal blood pressure. The high antioxidants content also ensures reduction of plaques in arteries for healthy heart function. Cumin has anti-congestive and expectorant properties that help break down phlegm and mucus accumulated in your sinuses and chest. Once broken down, mucus can be easily eliminated from the system by coughing it up or spitting. When phlegm and mucus are properly expelled, your body can begin to heal quicker. Drinking jeera water regularly helps to reduce inflammation, thus reducing asthma attacks. Consuming cumin seeds in any form, helps to improve blood circulation. Improved blood flow carries nutrients and oxygen efficiently to be distributed to all parts of the body, including the brain. With efficient blood and oxygen supply, the brain is able to function better, reducing the risk of cognitive disorders such as Alzheimer’s disease and dementia. Drinking cumin (jeera) seeds water regularly helps to rejuvenate your skin and gives it a healthy glow. Thanks to its high content of antiaging properties, rich minerals and vitamins C and E, cumin provides the right nutrients for healthy skin. Add some ground cumin powder to your face pack to treat skin issues such as pimples, acne, eczema, itchiness and other skin breakouts. How Does Cumin Help You Lose Weight? If you want to lose weight, cumin seeds are an excellent addition to your diet. Not only does it triple your weight loss effort, it also strengthens your immune system and you get to enjoy all the health benefits of cumin seeds as discussed above. One study compared the weight loss of women who ate 3 grams of cumin every day with women who didn’t eat cumin. While both groups reduced their calorie intake according to dietary advice, the women who consumed cumin showed an almost 15% decrease in fat after 3 months. Those who didn’t eat cumin daily had only a 4.9% loss in fat. By consistently consuming cumin seeds, and eating a healthy diet, you may be able to see loss of a few pounds weekly. One of the most notable weight loss characteristics of cumin seeds, according to scientific research, is that cumin can help your body to digest and absorb lipids (fats) efficiently. As you exercise and choose to eat healthy foods, cumin can maximize on those positive life changes. Some researchers recommend eating cumin as part of a weight loss plan, based on a study they conducted. In an experiment, they found that eating cumin for 6 weeks led to a decrease in body weight and in food intake. One other seed that is just as effective as cumin seeds in boosting your weight loss effort, is the fennel seed. 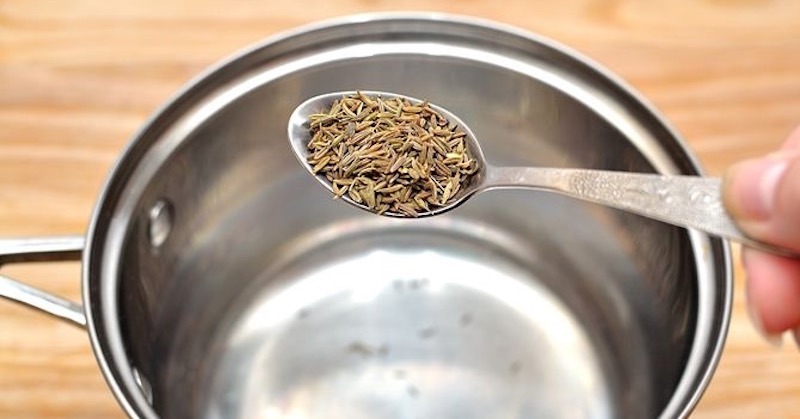 See here, how to make fennel seed tea. Related reading: The incredible health benefits of black cumin seeds. We like to use ground cumin seeds in our cooking. You can get the cabbage soup recipe here where we use ground cumin to triple weight loss efforts. How much cumin can you take daily? Cumin is generally non-toxic and can be taken in larger doses without any side effects. As a supplement, a typical dose would be between 300 and 600 mgs a day, depending on your body size. If you are making cumin seed tea, 1-2 teaspoons of cumin seeds a day will give you all the benefits of cumin. When is the best time to drink jeera water? It is recommended to drink jeera (cumin) water on an empty stomach, first thing in the morning before breakfast. It can boost your metabolism for the day. How long to drink cumin water for weight loss? 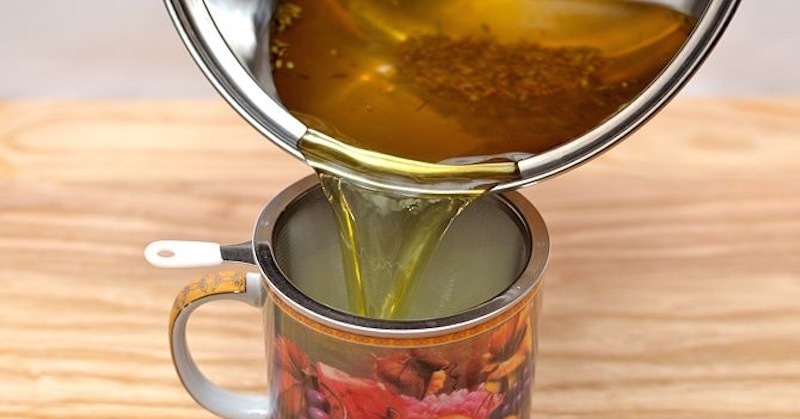 How long to drink cumin water for weight loss depends on how much weight you want to lose. With a generally healthy diet, proper exercise, and drinking cumin water daily, you will start to see some results after the second week of drinking it daily. Continue drinking till you achieve your goal. You’ll be happy to know that it is easy to start using cumin for weight loss. Our favourite trick is to make it into a hot beverage. This recipe works best when you make and drink it before eating breakfast. Add honey if desired and stir well. You can also try seasoning your cooked veggies with some ground cumin, or mixing it into your homemade hummus or guacamole (my personal favourite). Don’t be afraid to get creative—cumin seeds are versatile to be used in almost any food preparation.